A Great Place to Sit is an independent, privately owned, Licensed and Bonded company engaged in buying and selling tickets to all concerts, sports, and theatre events worldwide. We are proud members of the National Association of Ticket Brokers, and the Florida Association of Ticket Brokers. We are not affiliated with Ticket Master, or any venue, team, or box office. Ticket prices are governed by market value and can be higher or lower than the face value printed on the ticket. We DO NOT add service charges! The price you see is the price you pay. The only expense added to any order is shipping, and you always have the choice to pick your tickets up at our office, free of charge. The website only “marketplaces” often mark down the visible ticket price on their sites only to add a very high “service charge” on the back end, during the checkout process. OFTEN OUR TICKETS ARE THEIR INVENTORY – meaning they are buying tickets from us and marking them up to sell to you. All purchases are backed by our 200% Money Back Guarantee. We guarantee you a genuine ticket when you purchase from us. Transactions conducted on our website are safe and secure. We also take great care with your information. We do not share, buy, sell, or trade data with anyone. Our motto is “Service with Integrity” for a reason. We focus on doing the best for our clients using our extensive network of resources. With two hands-on partners who have over twenty years in the ticket business, you can always rest assured that you will get A Great Place to Sit at the right price. We run our company in a concierge style and we realize that your ticket needs don’t always happen during normal business hours. We are open 7 days a week with extended hours for your convenience. There is no purchase too large or small. We can handle anything from a single seat to a large corporate order. 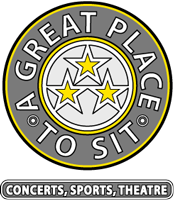 A Great Place to Sit is your source for all of your concert tickets, NFL football tickets, MLB baseball tickets, NBA basketball tickets, NASCAR racing tickets, NCAA football tickets, NCAA basketball tickets, NHL hockey tickets, as well as tickets to Broadway, Las Vegas shows, and even Food and Wine events! It doesn’t matter where the event is. We can get you the best tickets at the best price to any event – anywhere!